This photo made from the footage taken from Russian Defense Ministry official web site on Oct. 16, 2015 shows a target hit during a Russian air raid in Syria. Russian Defense Ministry said the strike was performed by an Su-24M bomber in Idlib. Russia's airstrikes in Syria have killed nearly 400 people, nearly a third of them civilians, since the campaign began three weeks ago, activist groups said Tuesday. The Britain-based Syrian Observatory for Human Rights, which relies on a network of activists inside Syria, said hundreds of Russian airstrikes over the past three weeks have killed 370 people, including 243 rebel fighters from Islamic State as well as al-Qaida's Syrian affiliate, the Nusra Front, and 127 civilians. The group said the dead civilians included 36 children and 34 women. Russia targeted the rebel-held Jabal al-Akrad region in Latakia province Monday. Its airstrikes killed at least 45 people, including rebel commander Basel Zimmo, who formerly served in Syrian President Bashar al-Assad's army, said the Observatory and the Local Coordination Committees, another activist-run monitoring group. 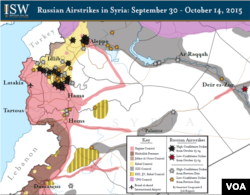 The strikes also wounded scores, making it one of the deadliest assault's since Moscow joined the conflict September 30. Russia has said it is targeting the Islamic State group and other "terrorists," but Syrian rebels and their supporters accuse Moscow of targeting moderate and Islamist rebels in a bid to bolster the Assad regime. Since the airstrikes began, Syrian troops and their allies from Lebanon's Hezbollah militant group also have launched ground offensives in northern, central and southern Syria as well as the in the suburbs of the capital, Damascus. Supported by the airstrikes, the ground troops have been able to capture areas formerly held by insurgents. Jabal al-Akrad is close to the rebel-held northwestern province of Idlib, which has been targeted by Russian warplanes. Syria's conflict, now in its fourth year, has killed more than 250,000 people, wounded a million and displaced half the country's population.